When discussing a star of Matt Damon's stature, there's little need for an introduction, so I'll keep it brief. Since he and pal Ben Affleck nabbed an Oscar for their "Good Will Hunting" script in 1997, the boyish, yet commanding actor has ascended into the top tier of Hollywood's leading men. A renaissance performer, he's proven equally adept at portraying dramatic ("Syriana," "The Departed"), comedic ("Dogma," the "Ocean's" films) and heroic (the "Bourne" franchise) characters, and continues to work with some of the most acclaimed directors in the business. 2009 is a big year for Damon, who stars in two upcoming, highly-anticipated prestige pictures. 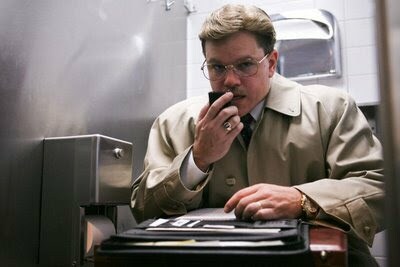 The first, the fact-based dark comedy "The Informant!," reunites Damon with his "Ocean's" director, Steven Soderbergh. The film, which marks the sixth collaboration between director and star, is an adaptation of the 2000 non fiction book of the same name by journalist Kurt Eichenwald. It follows Mark Whitacre, an Ivy League Ph.D. who blows the whistle on a corrupt company and also suffers from bipolar disorder. Co-starring Melanie Lynskey, Scott Bakula and "The Soup" talk show host, Joel McHale, the movie -- which opens Sept. 18 -- is said to be fiercely funny and a showcase for Damon. Later in the year (Dec. 11), Damon will appear opposite Morgan Freeman in "Invictus," director Clint Eastwood's much-heralded drama about Nelson Madela (Freeman) and his life during the 1995 Rugby world Cup in South Africa. Damon portrays South African team captain Francois Pienaar in the film, which is already gaining serious Oscar buzz. If both films perform as well as expected, Damon may find himself on the shortlists for both the Best Actor and Best Suppoting Actor categories.